Jesus’ encounters with the Samaritans in Jn 4:1-43 took place in many locations. The narrator cites three regions: Judea, Samaria and Galilee in 4:3-4: “3 He [Jesus] left Judea and departed again to Galilee. 4 He had to pass through Samaria.” Where are these places? After the general description of Jesus’ journey, the narrator focuses on precise locations: “So he [Jesus] came to a city of Samaria, called Sychar, near the field that Jacob gave to his son Joseph. Jacob’s well was there” (4:5-6a). The Samaritan woman in her later dialogue with Jesus, said to him: “Our fathers worshiped on this mountain; and you say that in Jerusalem is the place where men ought to worship” (4:20). 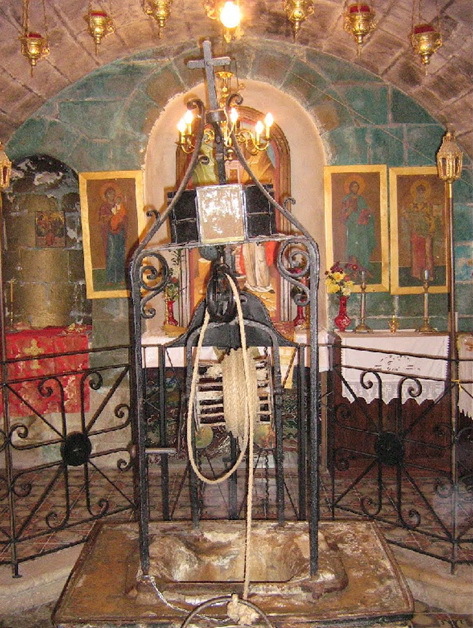 Jacob’s well is near Mount Gerizim; on its summit, there had been a Samaritan Temple. Therefore, in the mind of the Samaritan woman, “this mountain” (4:20) means Mount Gerizim, it is right before her eyes. This article investigates these places in Jn 4:1-43. Some maps of the Holy Land show the regions of Judea, Samaria and Galilee. 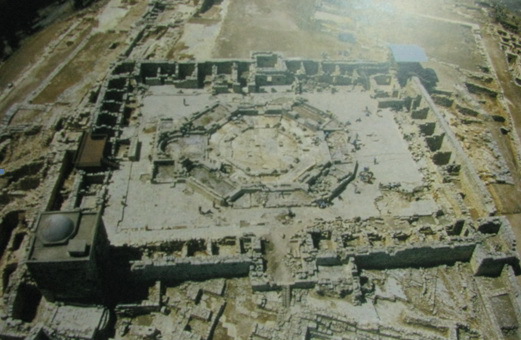 After that, we will talk about the ancient Samaria city, and present day city of Sebaste which is in the same location. The heart of the story consists in Jesus’ encounter with the Samaritan woman at Jacob’s well, near the town of Sychar. We will also present the findings of excavations in the Nablus region: Shechem – Sychar – Askar. 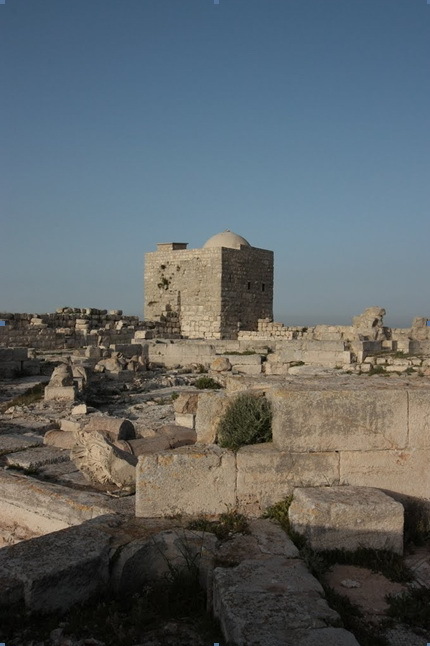 Many archaeologists identify Sychar in Jesus’ time with the modern village of Askar. Some photos of Jacob’s well and Mount Gerizim today are also included with a summary history of these places. Describing these places can help readers savor the imagery of the story. But more important, the narrator invites readers to transcend these places and apply the significant message of the story in their daily encounter with others. 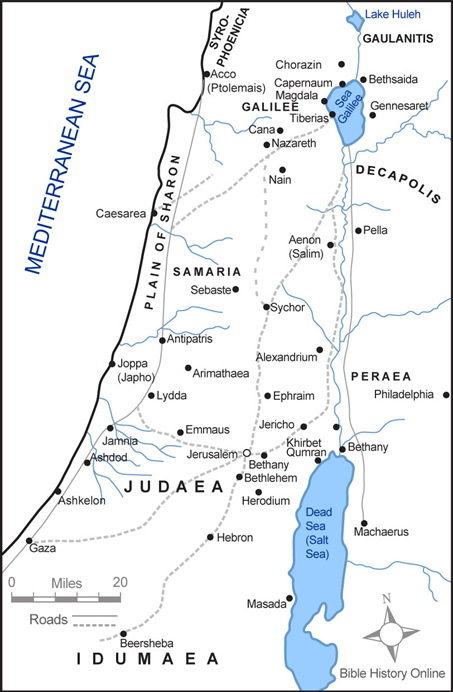 In Jesus’ time, the territory of Palestine was divided into three regions: Judea in the south, Samaria in the middle and Galilee in the north (see the map above). On this map, the territories of Judea and Samaria were only a province of the Roman Empire, while the territories of Galilee and Peraea were under King Herod Antipas. The Gaulanitis was under Herod Philip II. The Decapolis region, which in Greek means ten (deca) cities (polis), comprises a group of ten cities on the eastern frontier of the Roman Empire, in the region of Judea and Syria. Their political status was that of autonomous cities. In Jn 4:3-4, the narrator states: “He [Jesus] left Judea and departed again to Galilee. He had to pass through Samaria” (4:3-4). The name “Samaria” here is not only Samaria city but the whole Samaria region. Samaria city used to be capital of the northern kingdom of Israel from the time of king Omri (circa 885-874 BCE) until the city was taken over by Sargon II in 721 BCE (Before the Common Era, Before the Current Era or Before the Christian Era). Then it was conquered by Alexander the Great in 331 BCE, and was destroyed by John Hyrcan in circa 108 BCE (cf. Josephus Ant. 13:275-281). Pompey rebuilt Samaria city in the year 63 BCE. In 27 BCE, Augustus Caesar gave this city to Herod the Great, then Herod expanded and renovated the city and named it in Greek “Sebaste”, meaning “Augustus”, in the Emperor’s honor. 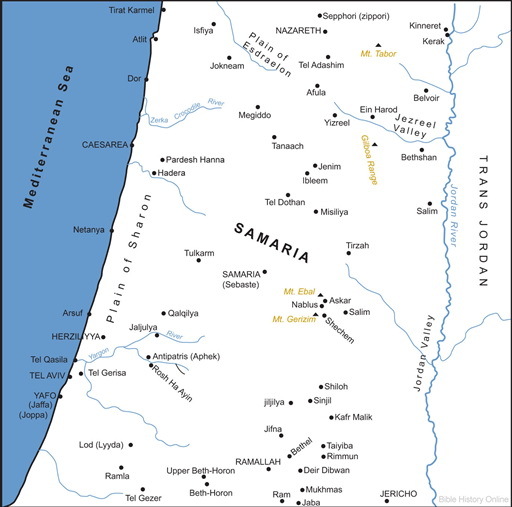 Therefore, on the map above, Sebaste city takes the place of Samaria city in the other map below. The Samaria-Sebaste city is home to a number of important archaeological sites. Excavations of these sites in Samaria-Sebaste have revealed six cultures of six successive periods: Canaanite, Israelite, Hellenistic, Herodian, Roman and Byzantine. Jesus had to pass through Samaria (4:4), but where exactly is the spot where Jesus encountered the Samaritan woman? And where is the place Jesus stayed with the Samaritans for two days? We will study these places: “Sychar – Askar – Shechem” (4:5a); “the field that Jacob gave to his son Joseph” (4:5b), “Jacob’s well” (4:6a) and “this mountain” in 4:20a, which refers to Mount Gerizim. In the middle of Samaria, we can see the following places: Askar, Shechem, Nablus, Mount Ebal and Mount Gerizim, but where exactly are Sychar town and Jacob’s well? 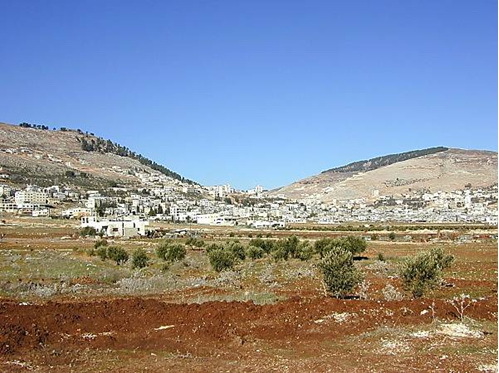 The town of Sychar is described in the Gospel of John like this: “He [Jesus] came to a city of Samaria, called Sychar, near the field that Jacob gave to his son Joseph. Jacob’s well was there” (4:5-6a). Jerome identifies Sychar with Shechem. In fact, in Syriac manuscripts the word “Shechem” is used for “Sychar”, but this identification was probably corrected by a later copyist. The description of Jn 4:5-6 invokes the text of Gen 33:18-20: “18 And Jacob came safely to the city of Shechem, which is in the land of Canaan, on his way from Paddan-aram; and he camped before the city. 19 And from the sons of Hamor, Shechem’s father, he bought for a hundred pieces of money the piece of land on which he had pitched his tent. 20 There he erected an altar and called it El-Elohe-Israel.” Nevertheless the town’s name in Jn 4:5 is Sychar, it is not Shechem. Besides, in the Bible, the name “Sychar” is mentioned only one time in Jn 4:5. Some scholars want to identify Sychar town with the ancient Shechem, but many others tend to identify Sychar town with Askar village of today. 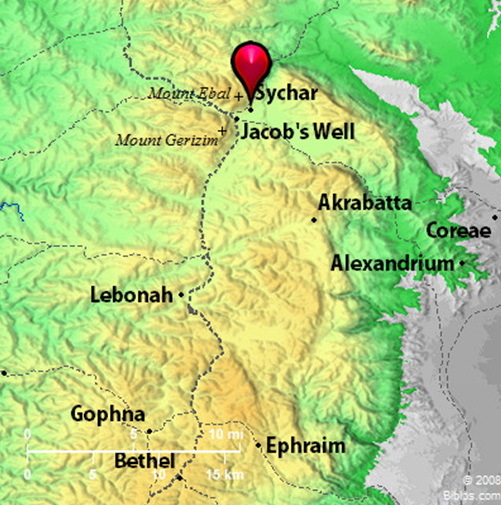 In fact, the criteria for identifying Sychar town are (1) near “the field that Jacob gave to his son Joseph” (4:5b) and (2) “Jacob’s well was there” (4:6a). Some scholars identify Sychar with Shechem because the excavations show that “the field that Jacob gave to his son Joseph” (4:5b) lies before the ruins of Shechem which is much closer to the modern Balata (see SCHEIN, Following the Way, 1980, p. 205). Many other scholars identify Sychar town with the village of Askar (see the map above). Rudolf Schnackenburg wrote: “The place called Sychar by the evangelist (Vg. Sichar) is mostly identified with the present village of Askar, a little more than half a mile north-east of the well of Jacob” (SCHNACKENBURG, The Gospel, vol. I, p. 423). Jn 4:5 describes Sychar by the words “polis” which means “city” or “large town”. Excavations at Balata have revealed the ruins of the ancient Shechem, but it is uncertain when the village came into existence. In fact, the ancient Shechem was destroyed in 128 BCE by John Hyrcan. 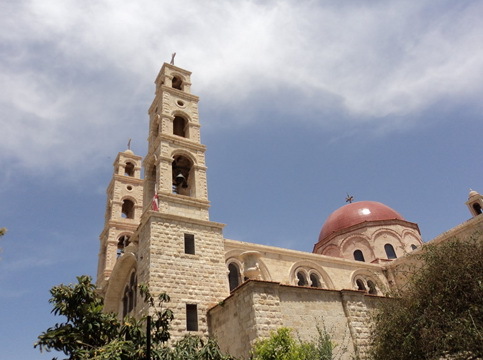 The settlement of Flavia Neapolis (about a mile and a half from ancient Shechem) was not yet in existence at the time of Jesus. Indeed, Flavia Neapolis was founded by the Roman Emperor Vespasian in 72 CE (Common Era, Current Era or Christian Era). 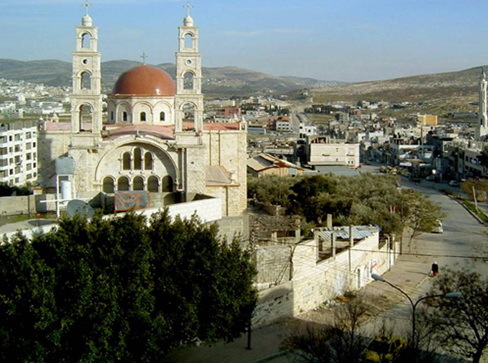 Today, the city’s name is Nablus. The village of Askar today is on the lower slope of Mount Ebal. This is the district east of ancient Shechem usually identified with “the field that Jacob gave to his son Joseph”. Though the settlement of Askar came into existence only from the Arab times, it may well be on the site of ancient Sychar. Now, as the result of recent excavations, the site at Sychar can be identified with Askar, a small Samaritan town on the base of Mount Ebal, north-east of Jacob's well. Possibly there were some Christians at Sychar town at the time of the composition of the Fourth Gospel. 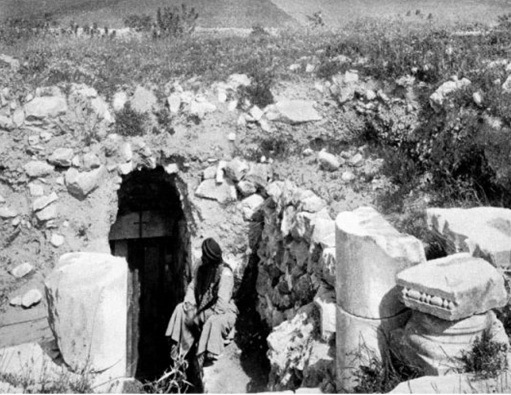 Bishop John H. Vincent commented about this photo in his writing “Earthly Footsteps of the Man of Galilee”, after he visited the well in 1894: “Jacob’s Well now belongs to a Greek Church (…). 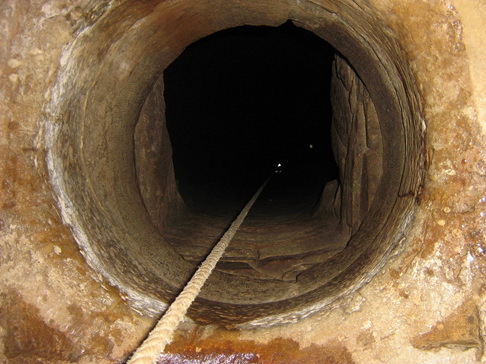 The well is now seventy-five feet deep and seven feet six inches in breadth. The diameter of the opening is seventeen and a half feet. A ruined vault stands above the well twenty feet long, ten feet broad and six feet high. The pieces of broken marble you see in the front belong to some ancient church” (http://hitch.south.cx/biblesidenotes-e20%20Jacobs%20Well.htm). 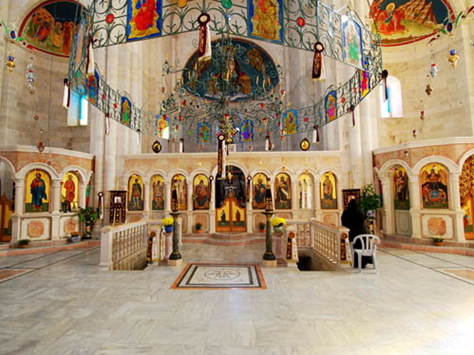 The Greek Orthodox purchased the ruins of churches that was the site of Jesus’ meeting with the Samaritan woman at Jacob’s well (Jn 4). The construction of the new church began before the First World War, but after only portions of the exterior walls were constructed, the construction was halted by the war. 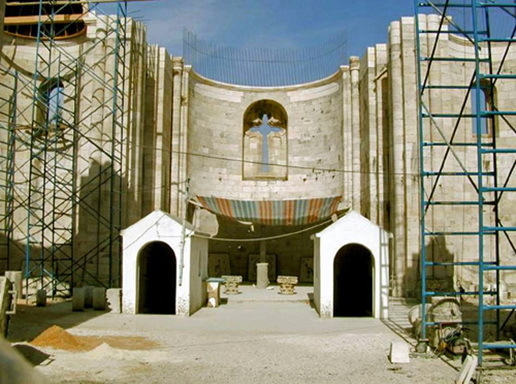 This photo shows the construction in 1999. Wells are unmovable, so we can be fairly confident that this well marks the precise spot where Jesus sat down and talked to the Samaritan woman (Jn 4). As she rightly said, ‘the well is deep’ (4:11). Indeed, it goes down over 70 feet (21 metres) and it still provides chill, clear water for drinking (WALKER, In the Steps of Jesus, 2006, p. 87-88). In Jesus’ time the well may have been deeper. Jewish, Samaritan, Christian and Muslim traditions all associate the well with Jacob. Mount Gerizim on the left, Mount Ebal on the right. Mount Gerizim is in Samaria, about 2,849 feet (868 meters) above the level of the Mediterranean Sea, and 800 feet (244 meters) above the valley at its foot. Mount Ebal is 3,076 feet (938 meters) above sea level, and 1,200 feet (366 meters) above the valley at its foot. (See more details in http://bibleatlas.org and http://classic.net.bible.org). Between these two mountains is the ancient Shechem. Sychar (Askar) was located at the base of Mount Ebal and Jacob’s well was south of the town in the direction of Mount Gerizim. In the days of Joshua, Mounts Gerizim and Ebal were sites for the recitation of blessings and curses (Jos 8:30-35). 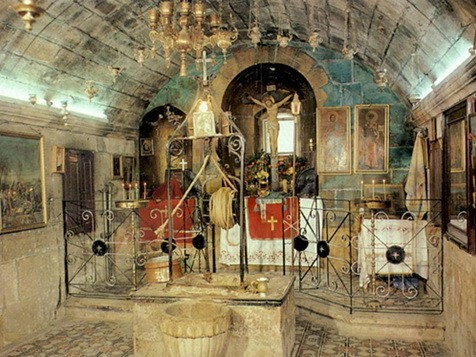 In the days of Jesus, Mount Gerizim was near Jacob’s well, the location where Jesus met the Samaritan woman. Mount Gerizim was certainly “this mountain” pointed to by the Samaritan woman in her conversation with Jesus in Jn 4:20. 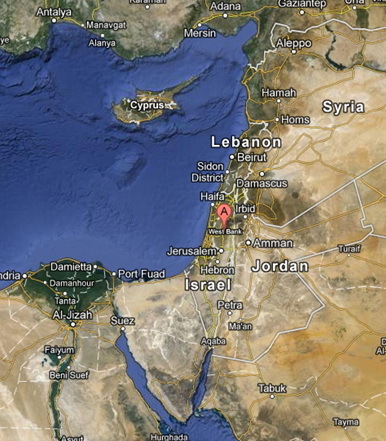 The historical context of Jn 4:1-43 includes some places in the Holy Land. In this pericope, the narrator mentions these locations: Judea, Samaria, Galilee, Sychar, Jacob’s well and “this mountain” (Mount Gerizim). The story of Jn 4:1-43 focuses on Jesus’ encounter with the Samaritan woman and the other Samaritans of the Sychar town. Additional information about these places, from the Old Testament, New Testament and other available sources today will help readers to understand the message: “Where” and “how” Jesus accomplished his mission and revealed himself. The worship at any particular place is limited in space and often causes conflict. The true worship of Jesus’ disciples is not limited to a place but can be done in Spirit and truth. In other words, wherever Jesus’ disciples are present, their place of worship can also be there. This means the disciples of Jesus can worship the Father in Spirit and truth, anywhere at any time. Jesus’ encounters with the Samaritans took place in concrete locations in Samaria, at Jacob’s well and Sychar town. Nevertheless, the story invites readers to go beyond these places. Jesus’ disciples today can transform their daily encounters with others by imitating Jesus’ meeting with the Samaritan woman at Jacob’s well. Through the story the narrator encourages his community to realize their mission in this world. That is to say, if the daily encounters of each of Jesus’ disciples today can help others break down the barriers (i.e. beliefs, gender, places of worship), and lead others to discover that Jesus is “the Savior of the world” (4:42), then it can be said that the message in Jn 4:1-43 has been realized./. KEENER, Craig S., The Gospel of John. A Commentary, vol. I and II, Peabody (MA), Hendrickson Publishers, 2003, 1636 p.
Revised Standard Version - Second Catholic Edition, 2006 (RSV-SCE). SCHEIN, Bruce E., Following the Way, the setting of John’s Gospel, Minneapolis (MN), Augsburg Publishing House, 1980. SCHNACKENBURG, Rudolf, The Gospel According to St. John, vol. I: Introduction and Commentary on Chapter 1–4, New York, The Crossroad Publishing Company, (1965), 1987, 638 p. (Orig. Das Johannesevangelium, 1965). WALKER, Peter, In the Steps of Jesus, an Illustrated Guide to the Places of the Holy Land, Oxford, Lion Hudson, 2006. WIGODER, Geoffrey, (Ed. ), The Illustrated Dictionary & Concordance of the Bible, New York (NY), Sterling Publishing, 2005.